The Colombia International Field Program ran from 2012 to 2016 as a collaboration between the New School, the Universidad Autonoma de Manizales (UAM) and municipal governments in the Department of Caldas, Colombia. On hiatus for 2017, the Colombia IFP will likely be rebooted for 2018. The Colombia IFP was designed to overcome one of the primary limitations of practice-based learning: its tendency to be episodic, lack continuity and thus of limited impact. Having been on the receiving end of student projects as an NGO executive director, I know how organizations and communities often find that students are earnest and willing to learn, but often we end up expending far more energy training them than we actually receive in terms of tangible achievements. This is an issue that has certainly been discussed in the New School (NS) and is well known in the NGO world. The collaboration with UAM and municipal governments was intended to overcome this significant problem UAM undergraduates in their senior year must participate in the Paz y Competitividad (PyC) program which entails dedicating a semester of research and labor in the service of municipal governments. IFP and PyC then are in effect sister programs. The plan for the IFP then was to integrate UAM PyC students with NS students during the summer IFP, and then in the subsequent academic semesters more UAM students would build on the work, and engage with NS students remotely. Then when the IFP returned the following summer the new team would continue to move the work forward. In concept then between the two universities it would be possible to have episodic but continual engagement by students which, though the episodic nature would introduce hiccups, promised to have a far deeper and more sustainable impact on the projects. I am currently preparing report detailing the findings of our work in Colombia. This report will include reflections on and recommendations for the future design of the Colombia IFP and engaged learning initiatives in general. The report will also provide insight on the institutional challenges that Colombia is facing as it strives to implement post-conflict initiatives that seek to both constrain violence as a mode of political action and generate economic opportunity to meet the many needs of its citizens, rural citizens in particular. 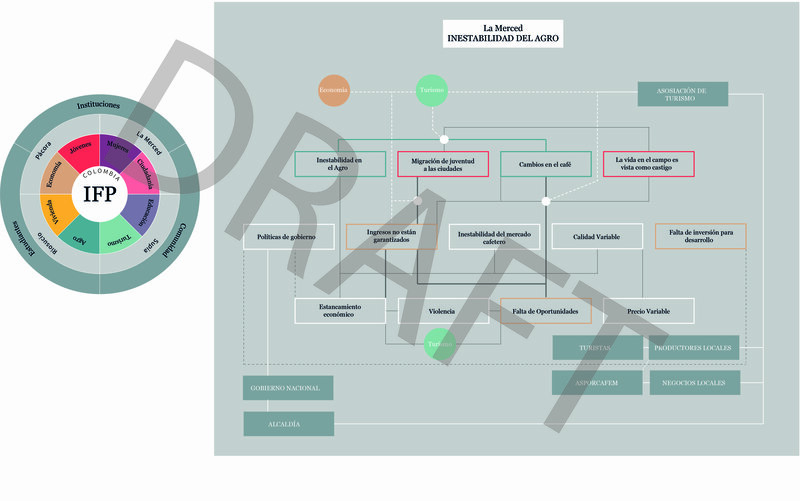 The bullseye diagram serves as a thematic index of the report which will be both in print and as a webpage and the draft concept map outlines some of the issues we have addressed in one of the towns. This video, filmed in 2014, provides an introduction to the program and some of the work we have conducted (see as well an interview with a 2015 student participant and article in La Patria).